Performances are still held here we saw a poster for a performance scheduled with Bill Murray! Happy to get back on the road again after our pit stop back home, we had forgotten that our last-minute plane ticket to Greece required us to spend the night in the Dublin airport. While I got a few winks of sleep in the restaurant booth Lauren stared at me madly envious of my ability to sleep anywhere and in any position. For my own safety I am going to try my best to make this the last time I buy a plane ticket with an overnight layover. When the wheels touched down in Athens, the tables had completely turned. Lauren slept the whole flight while I barely got a wink of sleep. It was not for lack of trying…my sleepiness was due wholly to my sleep nemesis whom had been tragically seated beside me. When she sat down she seemed nice enough telling me of how she never flies on budget airlines like Ryan Air, but she just didn’t want to wait the several extra hours. She went on for the first 20 minutes without taking a single breath between sentences while the plan pushed back and took off. I continually gave subtle hints that while conversation with a stranger can be nice it was just not what I was looking for on this particular flight. As if putting in my head phones was not enough of a sign she continued to pester me until finally I politely told her I had already been traveling for quite some time and really needed to get some rest. She finally quieted down…for about 15 minutes, until she asked me to switch seats giving me the row seat. I obliged and quickly realized why she wanted to switch because the air was blowing directly in my face, but with my eyes closed it felt kind of good on the cramped jet so I went with it. The next emergency worthy of waking me 20 minutes later was to throw out her trash for her when the flight attendant came by. I mean how could she ever reach across my slumbering body and hand it to the flight attendant herself? That would just be madness. After the third time of getting up to let her use the restroom I refused to budge on the fourth shoulder tap. I had had it! I was actually so tired by that point I hardly remember her frustration and squeezing past me while I slept in my seat. Upon her return from the bathroom, the witch sternly ordered me to take my seat back because I had not moved for her. Again, I obliged and took my seat back deeply satisfied with my defiance. For about the last 30 minutes of the flight I slept like a baby and didn’t say another word to the lady while we waited to get off the plane. My parents (Mom and Dad C) were waiting for us already at our Airbnb while we took the metro from the airport into Athens. We were greeted at the metro station by Nick the “handler” for the Airbnb who loved to talk with us all he could to learn about us and practice his English. With everybody exhausted on the first day from jetlag we just relaxed a bit and ventured out to dinner for some Greek/Spanish fusion recommended to us by Nick. I borderline liked an olive at this place, it was a green one and soaked in fresh squeezed orange juice. Everything we ate at this restaurant was fantastic and they had the best hummus of our trip which ended up being very hard to find in Greece to our surprise. At the end of dinner, they also gave us free dessert and a shot of some sweet liquor which I had thought might be ouzo, but that was not the case I found out later. Lauren and I ran out in the morning to grab some breakfast and also stock up on our coffee for the week. We have gotten into finding the best artisanal coffee shops everywhere we go so we can brew our own pour over coffee because it is so hard to find coffee without espresso in Europe! 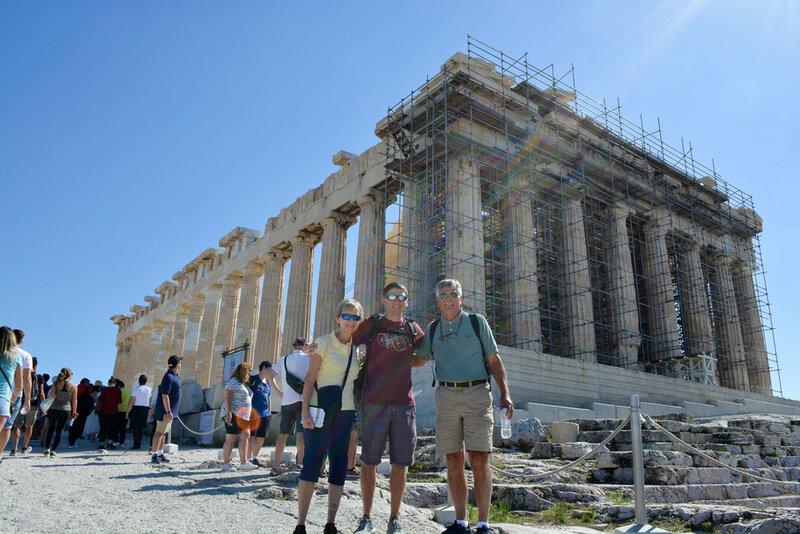 We had a long list of sights to see in Athens and only one day to fit it all in. 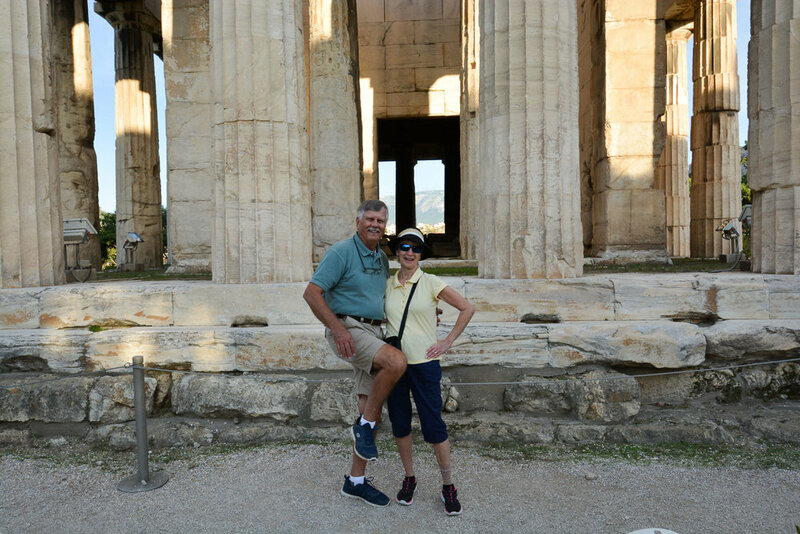 We took my parents on the metro to the acropolis to start the day. 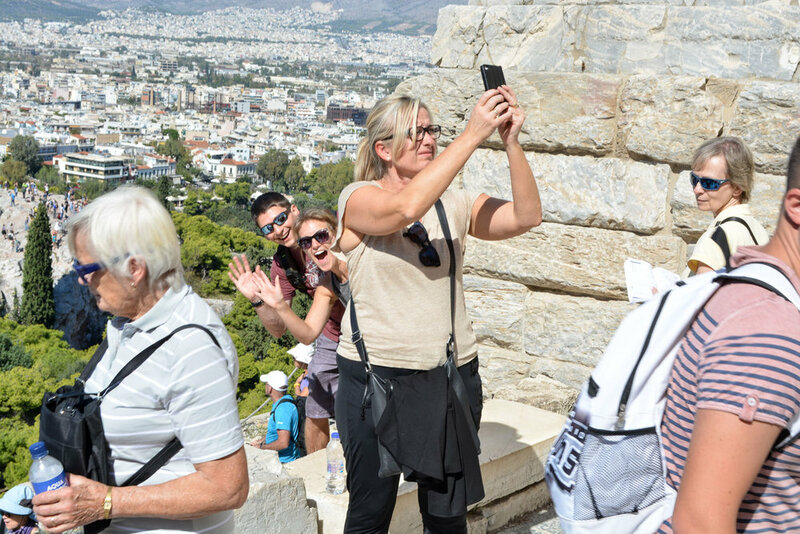 If you go to the acropolis learn from our mistake and plan ahead by buying your tickets online, it will save your hours waiting in the lines for tickets! Fortunately, Lauren and I are way too impatient to even consider waiting in an hours long line and were determined to find another way in. 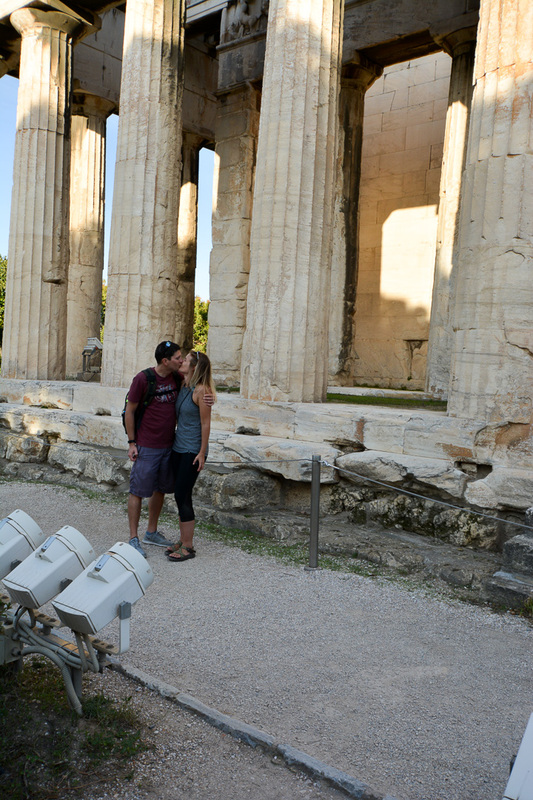 After hearing we could buy tickets online, we whipped our phones to search for some wifi to hack into and much to our chagrin the acropolis had free open wifi. We were able to buy our tickets on our phones, salvaging our plans for the day. Ancient marvels of construction always fascinate us when we think about how in the world did they build this with the tools of the time. What always fascinates me the most is thinking about how they moved and stacked these massive stone columns. We noticed some massive stones with Lego like knobs stacked at the tops of the columns…intriguing. 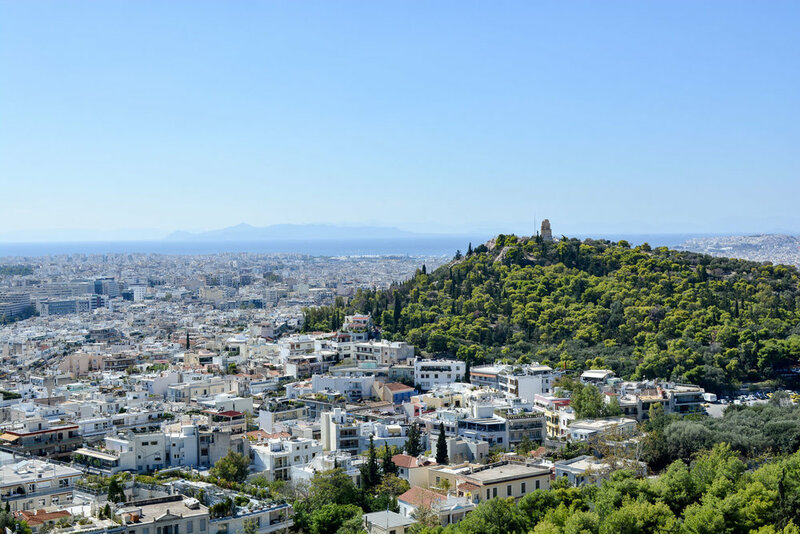 One look out in any direction from the top of the acropolis will explain why they picked this site for their most sacred building devoted to their gods. I loved looking out over the water where I could see the closest islands, rising up out of the water revealing the spine of an ancient mountain range. Dad W and Lauren circa 2008. It was interesting for Lauren to see how the restoration work had come along in the past 10 years! Demonstrating how oblivious people are when you’re trying to get a picture taken. They just walk right in front of you and take their own! 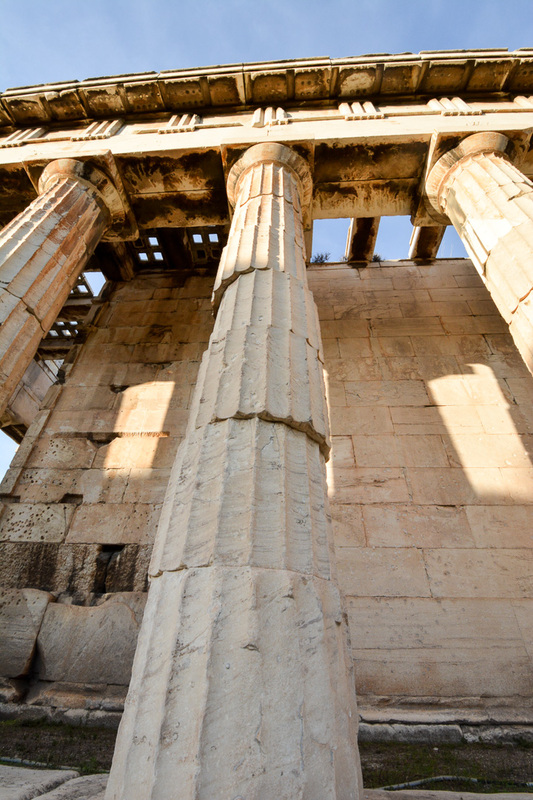 I didn’t realize before visiting the acropolis that the Parthenon was completely walled in behind the outer columns. I had for some reason imagined that the entire structure was open air, but it all made sense when I learned more about the function of the Parthenon. The only people allowed inside the structure were the religious big shots that maintained the temple. 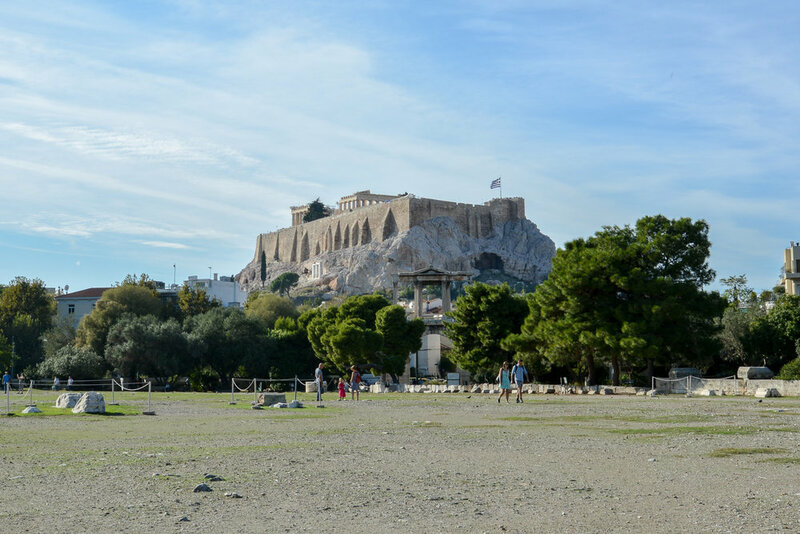 The common folk would carry their offerings to the gods up to the acropolis and place them outside of the Parthenon trusting the priests to bring their gifts inside to be placed on the alters. Another revelation I had happened in the archaeology museum when I realized that they also painted the sculptures that they carved in marble. It is rare for any statue to have survived with the paint because most were subjected to the elements over time stripping it away. There were a couple statues that they uncovered where the paint survived the test of time because they had been buried long ago by an earthquake. One last interesting tidbit about the statues before we move on. In some of the statues the eyes were not sculpted and were actually concave depressions into the head. They would craft realistic looking eyes and place them in the carved eye sockets to make the sculpture appear even more lifelike. 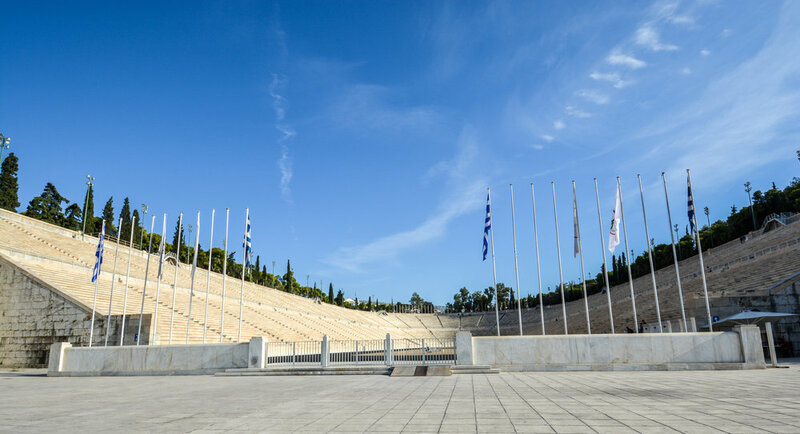 Between the acropolis and the Agora we visited the Temple of Zeus and the first modern Olympic stadium on our walking tour around the city. 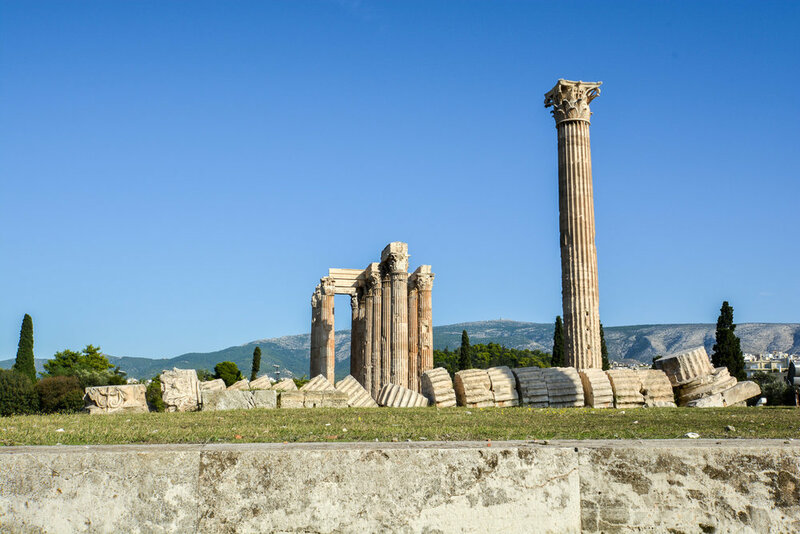 The temple of Zeus was mostly just a pad of green grass with a few columns reconstructed to show the scale of the ancient temple. I found the one toppled column the most intriguing because it had fallen like a row of dominoes in the wind. Looking back at the acropolis from the Temple of Zeus made me realize just how enormous the Dyonisis Theater was at the base of the acropolis. The theater is still impressive today and only about 1/3 of the original seating is still visible! The Olympic stadium was interesting to see from the outside, but not interesting enough to pay the entrance fee just to walk around it a bit. When we hopped in the cab for the Agora it made me think about all the great Greek brunches, we had back home at our once-upon-a-time favorite brunch spot in DC named Agora. By the way bottomless drinks at brunch are very much a DC thing. 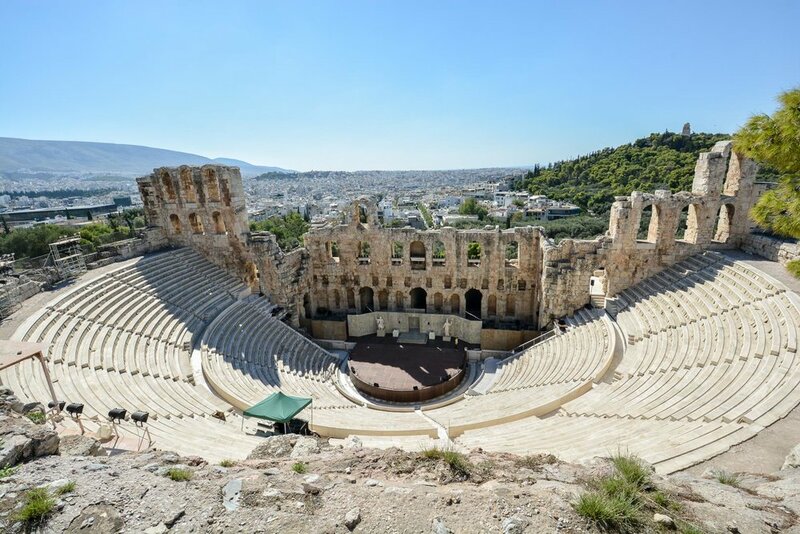 The Agora of Athens is the ancient city center and meeting place. We toured a reconstructed two-level market that was about 200 feet long! 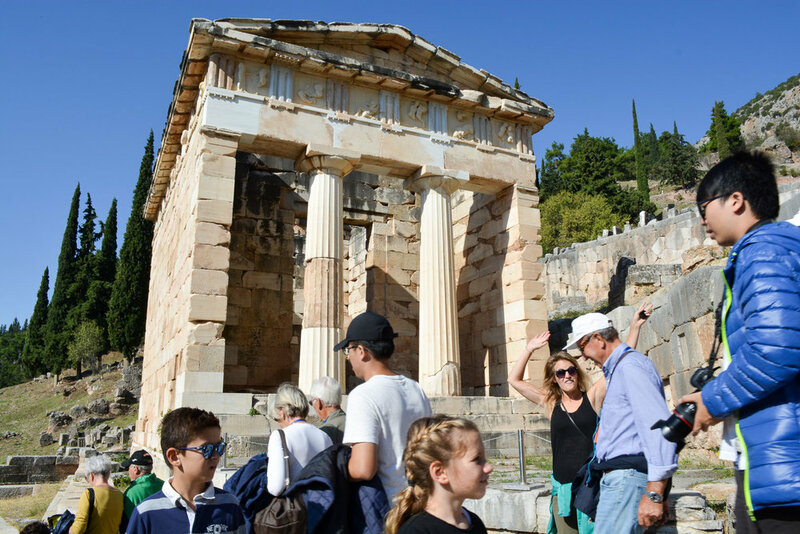 We walked all around the Agora complex and also saw a very old and cute church and one of the best-preserved original structures of the ancient times, the Temple of Hephaestus. 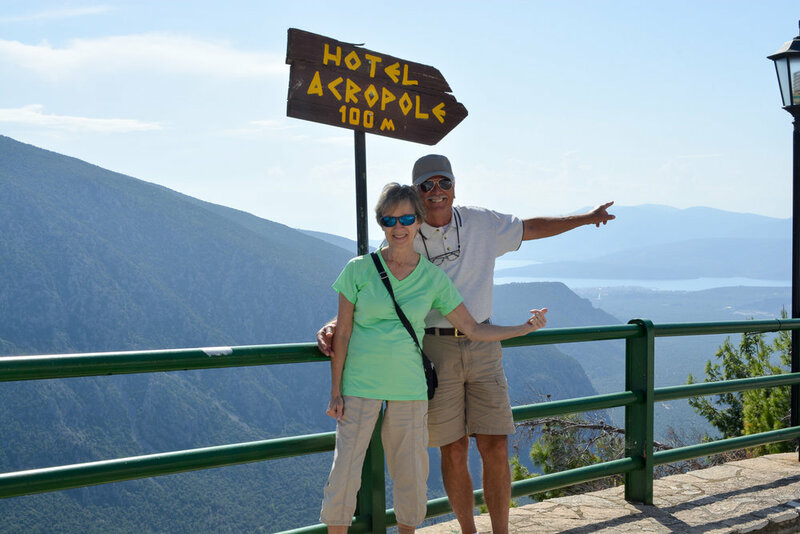 The next morning, we were picked up very early for our drive to Delphi with George’s taxi. On the way our driver, Dimitris, gave us a good brief history of Delphi giving me a flashback to a scene in the movie 300 when Leonidas went to the oracle’s to ask for their blessing to go to war with the Persians. I didn’t realize this scene was depicting the king visiting Delphi to see the oracle. Now, Hollywood, as usual, took some dramatic liberties with the scene, but we found this site fascinating and the history with it. 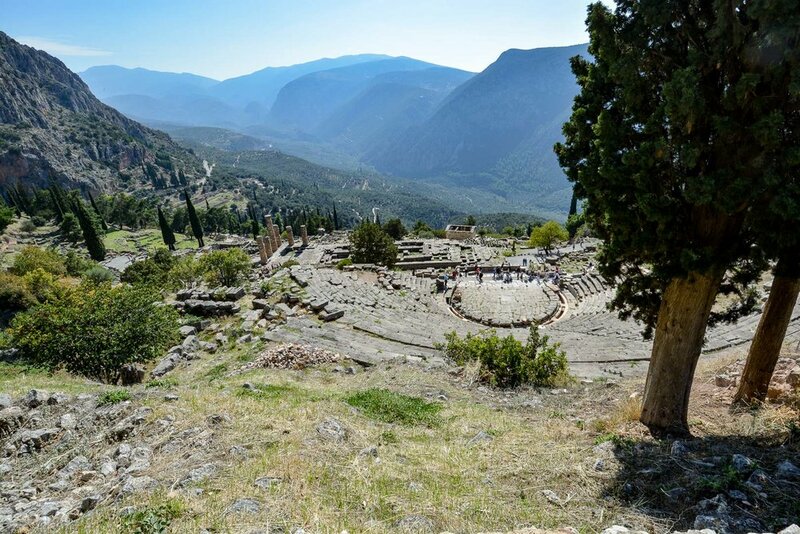 The sacred site of Delphi is built on a perch in the mountains with divine views all around. More importantly than the views is what is happening below the surface. 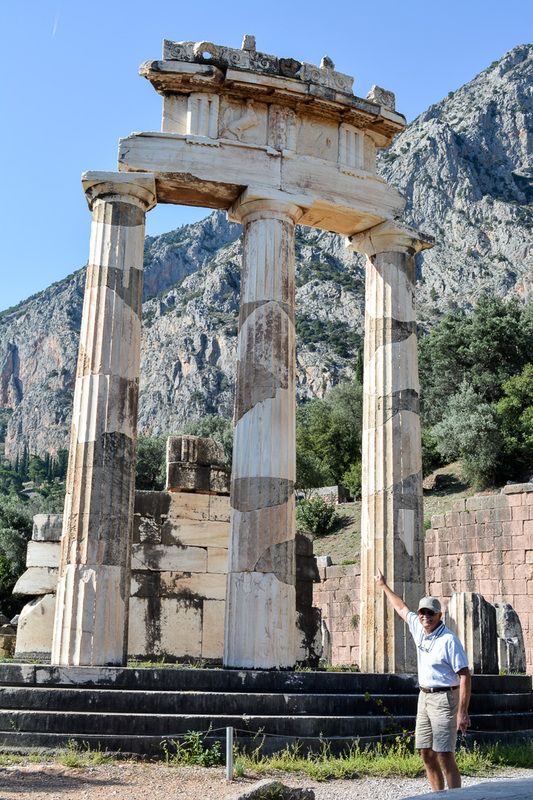 The Temple of Apollo in Delphi was deliberately built directly on a fault line running through the mountain range. In this temple the oracles, who were always women and would take turns, sat in the crypt of the temple on a three-legged stool carefully placed, straddling an open crack in the earth. The location was key for the oracles to inhale the noxious fumes and enter a trance state allowing the gods to speak through them. After - demonstrating the miracle of photoshop…..jk patience is a virtue! 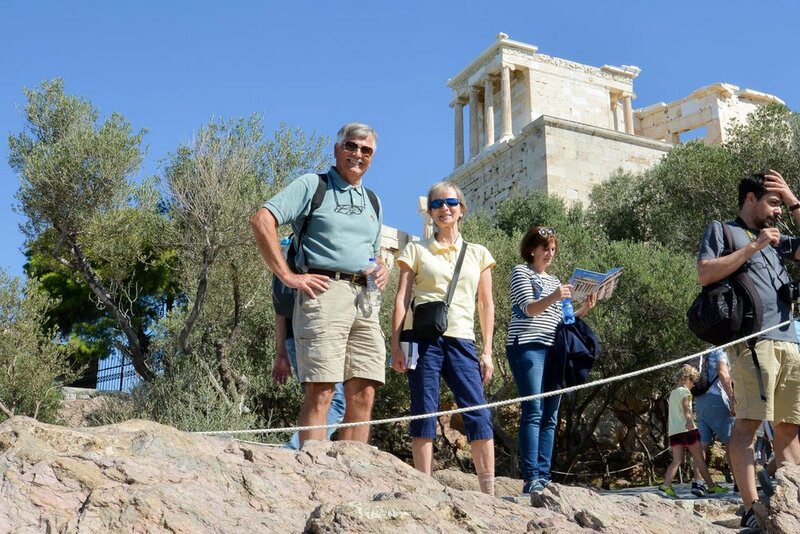 We found the hours that the oracles worked equally as interesting as the history of Delphi. In only the warm months of the year and for only one day a month the oracle would accept visitations assuming of course that the sacrificial goat did not act peculiar on the way to the alter for slaughter. Talk about work-life balance. Should any of the preparations for the day go awry the gods were not pleased and there would be no visitations, better luck next month. Every visitor was required to bring gifts to the gods for their opportunity to ask the oracle a question for life guidance and more importantly they were lined up in order of value and importance of their gift so if your cheap it’s to the back of the line with you and no promises you will get to see the oracle. It is said the oracle’s would respond in riddles to the visitor’s questions and one must know thyself in order to correctly decipher the code. Exploring this ancient site was very interesting after learning all of the history on the way. Even though most of the site lays in ruin, the foundations that remain paint the picture of the prosperous religious site. A couple of structures have been reconstructed to show the dozen or so small structures used to house the valuable gifts offered by the many city-states. 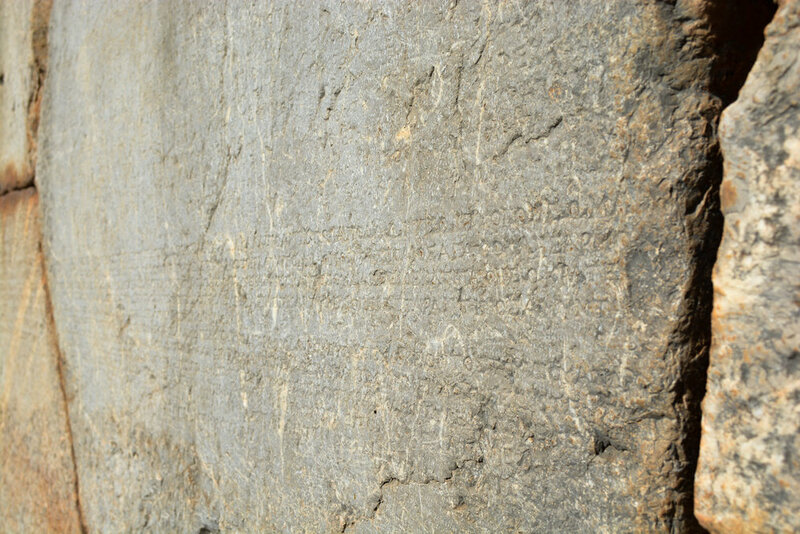 Not much is left of the temple of Apollo, but the lower foundation wall was very interesting as it had the names of thousands of freed slaves carved into the stones to cement their freedom. Being a religious site, nobody would dare attempt remove a single name from the list for fear of divine retaliation. The visitors coming from all over to see the oracle would not simply show up on the chosen day of the month, they would many times spend months at the site waiting for their turn for guidance from the oracle. To pass the time these visitors built additions to the city like a theater for entertainment while they waited and a stadium at the top of the hill for competitions. 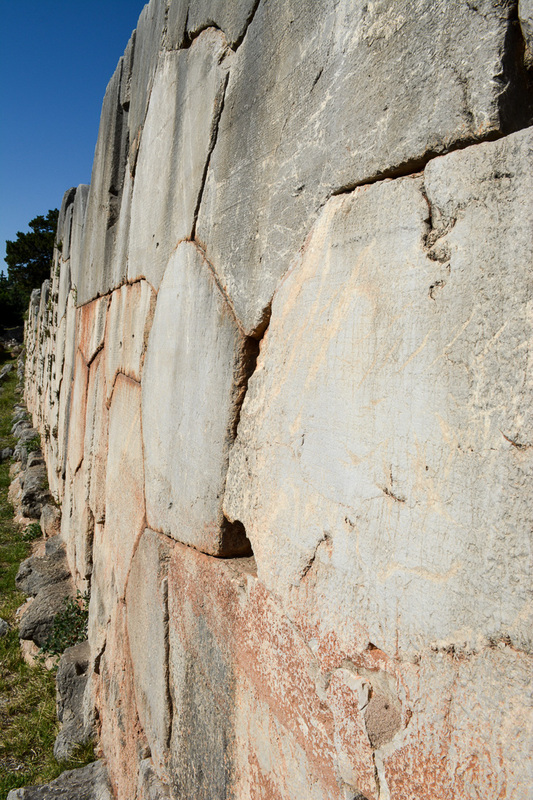 Very little remains today of the many monuments that stood in Delphi commemorating numerous war triumphs of the Greeks. My favorite trophy that once stood near the center of Delphi is the memorial commemorating the defeat of the Persians which was a tall bronze statue of three serpents wrapping around each other until the top of the column where their three heads arched out to support a solid gold trophy at the top. 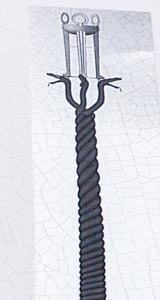 Artists rendition of what the original column and trophy may have looked like. 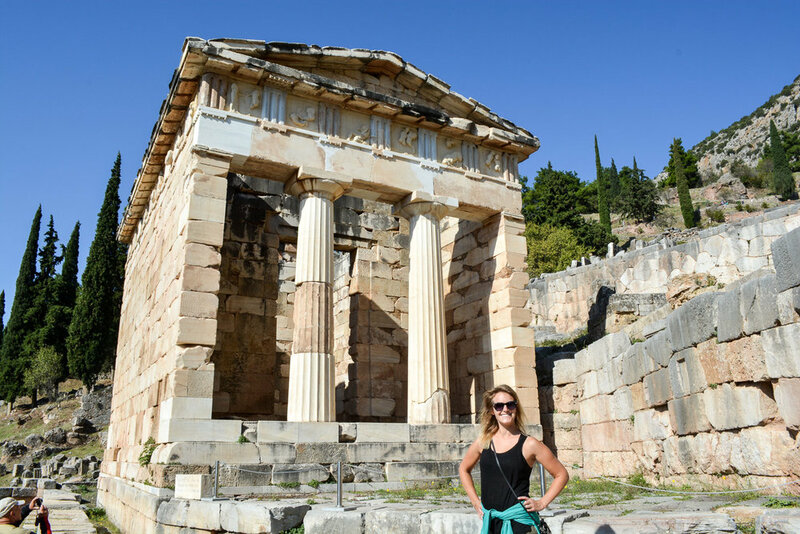 On our way out of Delphi we stopped and took a look at the nearby temple of Athena which was built in a circle of 23 columns. Not much is known about the purpose of the temple, but it is peculiar because of it’s circular shape contrasting to the standard rectangular shape of almost every other temple of the time. We were tired when we got back and decided to grab take away pizza from a vegan friendly pizza place. Didn’t think too much of the mention of cannabis on the menu, but Lauren noticed a guy buying a whole lot of it when we picked up our pizzas. Thankfully there was no cross contamination! No Dad there is no diet coke up there!